The Thyroid is a butterfly-shaped gland that wraps around the front part of your neck just below your Adam’s apple. The Thyroid makes hormones that help control your body’s metabolism. The hormone produced by the Thyroid has an effect on almost every tissue and cell in your body. The Thyroid operates as part of a feedback loop involving body parts called the Hypothalamus and the Pituitary gland. First, the hypothalamus sends a signal to your pituitary gland through a hormone called TRH. When your pituitary gland receives this signal, it releases another hormone called TSH to your thyroid gland. Upon receiving TSH, your thyroid releases 2 of its own hormones (T3 and T4), which then enter your bloodstream and affect the metabolism of your heart, liver, muscles, and other organs. Finally, your pituitary gland monitors the level of thyroid hormone in your blood and increases or decreases the amount of TSH released, which then changes the amount of thyroid hormone in your blood. Ultrasound is like ordinary sound except it has a frequency (or pitch) higher than human beings can hear. When sent into your body from a device called a transducer resting on your neck, the sound echoes back from the organs inside your body. These returning echoes are converted by a computer into a picture. During your thyroid ultrasound examination, ultrasound will produce pictures of your thyroid gland, including its size, shape, and blood vessels. The ultrasound will reveal any nodules (lumps) or cysts (lumps with fluid) that may be present in your thyroid gland. An ultrasound examination is commonly called the practice of sonography, but also may be referred to as diagnostic ultrasound imaging. Why should I have a Thyroid Ultrasound Exam? Abnormalities in your thyroid, such as masses or cysts. A sonogram may not provide all the information your doctor needs. In these cases, more studies or tests may be needed. These may include blood tests; a biopsy in which your doctor removes a small amount of cells or fluid; or other types of ultrasound examinations. There are no known harmful effects linked to the medical use of ultrasound. What do I need to know before my Thyroid Ultrasound exam? In most cases, a sonographer, who is a professional trained to conduct ultrasound examinations, will perform the exam. He or she obtains and records a series of pictures. Your doctor then reviews the pictures. The doctor may discuss your exam with the sonographer, and will then give you an official explanation or interpretation of what was seen on the sonogram. This interpretation may not be available immediately after you have your exam. In some cases, the doctor also will examine you to confirm or resolve uncertain or unclear findings. There is no special preparation for this examination. There is no pain involved in an ultrasound examination of the thyroid. The transducer is placed on your skin surface after a gel is applied to your neck to provide better contact. The length of time for the examination will depend on the specific reasons your doctor requested it. The reasons will affect how complex the examination needs to be. What are the limitations of an Ultrasound exam? It may be difficult for a sonographer or doctor to obtain the desired pictures if you have a short or thick neck. Also, if there are multiple nodules or cysts, it can be difficult for the doctor to see each one individually. 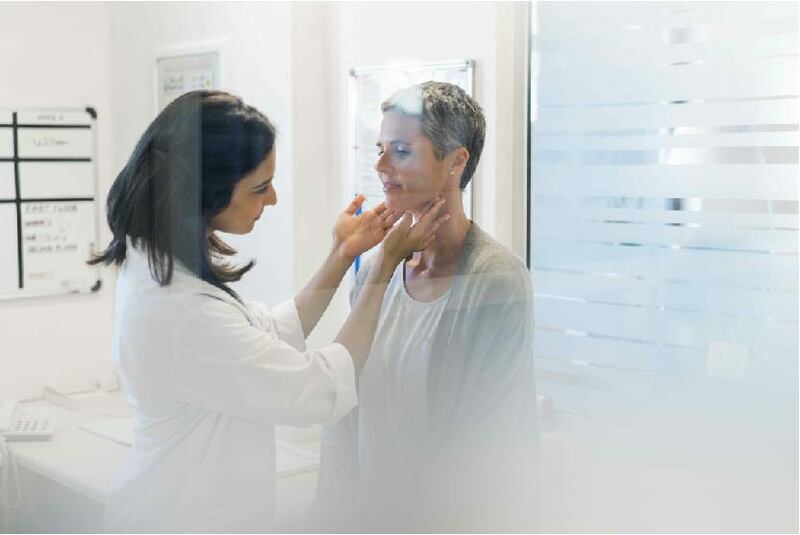 An ultrasound examination of the thyroid cannot determine the exact cause of a nodule; however, there are characteristics of the image that can help the doctor determine if there is a high chance of cancer (malignant) or a low chance of cancer (benign). Your doctor may recommend further tests, such as an ultrasound-guided biopsy or a fine-needle aspiration. Finally, the quality of the ultrasound examination also depends on the examiner’s experience and the type of equipment used. AIUM ultrasound practice accreditation is a voluntary review process that allows practices to demonstrate that they meet or exceed nationally recognized standards in the performance and interpretation of diagnostic ultrasound examinations. AIUM Accreditation demonstrates our commitment to clinical excellence and commitment to the highest quality patient care. What is Thyroid fine needle biopsy? This is a short procedure that is done in the office. It involves taking tissue samples from one or more areas in the thyroid gland. It is done under local anesthesia, and with ultrasound guidance. What is the Afirma GEC (gene expression classifier)? We use the latest in thyroid fine needle biopsy techniques with ultrasound guidance. We also use the most advanced technologies for evaluating thyroid biopsy specimens. We participated in a research trial which led to the use of molecular diagnostics for evaluating selected thyroid biopsy specimens and now we routinely use the Affirma gene expression classifier (GEC) to evaluate thyroid biopsy specimens. The Affirma test is done on specimens in which the result is not clearly benign or cancerous. It tests proteins inside of the cells to determine if characteristics are consistent with benign or cancerous findings. This technology has reduced the number of patients requiring surgery.